The CoverCat 300HV is a Compressed Air powered High Volume metering and spray or dispensing pump mounted on a frame or cart unit with option lift frame avaiable. 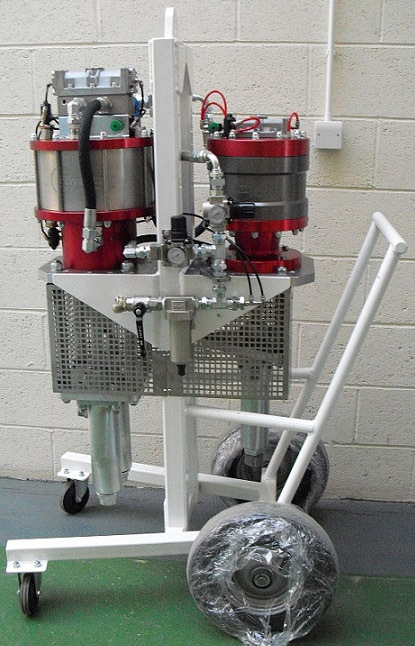 A secondary pump is fitted to the back of the unit for use as a primer spray or solvent flush pump as required. The fixed ratio system is a longstanding method supporting reliability from CoverCat designed and made in the UK brand. The use of the 300 Air Motor and the new control system allows a free flowing air passage to greatly improve on CoverCat superior power. The Unit comes supplied with 3/4” air inlet which includes Air Filter, Regulator with pressure gauge and Lubricator. All are all made from metal case components to avoid damage in industrial areas. The unit capable of high pressure delivery of 10.6 litres/min (2.2gpm) at 20 cycles/min. Hose lengths up to 45m can be used with a standard 5 meter whip hose to a total of 50metres.